People with irritable bowel syndrome (IBS) may suffer from constipation, diarrhoea (sometimes one alternating with the other), abdominal aches and pains, abdominal bloating, and/or flatulence. In chronic cases these gut symptoms can eventually cause other major health problems such as fatigue, depression, malabsorption syndrome, nutritional deficiencies, etc. Infection – Many of our irritable bowel syndrome patients have found to have either a bacterial, parasitic or yeast infection in the bowel that may be contributing towards their symptoms. Parasites such as Blastocystis, Dientamoeba fragilis and cryptosporidium, yeasts such as candida and pathogenic bacteria such as clostridium are all too common in IBS patients we see. Food intolerance – any food allergy or intolerance may contribute towards irritable bowel syndrome symptoms. Generally the most common problem foods are dairy, gluten and yeast however you could potentially be intolerant to just about anything in your diet even foods you may consider to be a healthy such as various fruit and/or vegetables. Sugars may also exacerbate IBS symptoms. Poor Digestion/Absorption – In some irritable bowel syndrome cases we find a deficiency in pancreatic enzymes which are responsible for the appropriate digestion of the foods you eat. If not digested properly due to pancreatic deficiency the food remains in your bowel and feeds opportunistic bacteria resulting in fermentation which can contribute towards your IBS symptoms. Bacterial Flora Imbalances (Dysbiosis) – many irritable bowel syndrome patients we see are found to have inadequate numbers of beneficial bacteria in their bowels which are responsible for a balanced immune system and also aid digestion. Emotional Issues – strong emotions, such as anxiety or stress, can affect the nerves of the bowel in susceptible people and cause irritable bowel syndrome symptoms. In addition many suffers tend to bury their undelt with emotions which usually involve not accepting life into their bowels thus causing IBS symptoms. Medications – certain drugs (such as antibiotics, antacids and painkillers) can lead to constipation or diarrhoea. (1) Complete Digestive Stool Analysis (CDSA) – this test will be able to determine the balance of beneficial bacterial flora in your gut, check for the presence of any pathogens such as parasites, yeasts or pathogenic bacteria, access pancreatic function and digestion as a whole, checks for absorption markers, diagnose gluten allergies, to name a few. This is very important information to determine how to balance and repair gut function. We use PCR testing for our stool analysis testing as they use a DNA technique which involves analysing stool for genetic material of parasites, which greatly increases sensitivity. This test is considered 5000 times more sensitive than standard stool tests and is the test we currently recommend for all our patients. These tests may be arranged by us during a consultation. (2) Food Allergy Blood tests – this test will be able to detect any food allergies and/or intolerances in order to be able to tailor make a specific diet avoiding any problematic foods that may be contributing towards irritable bowel syndrome symptoms. (3) Heavy Metal 24hr Urine test with chelating agent challenge – this test has been included for some patients who appear to have a heavy metal issues which is known to damage the mucosa of the gut wall lining and thus produce irritable bowel syndrome type symptoms. (4) Gut permeability urine test – irritable bowel syndrome has been associated with increased gut permeability (leaky gut syndrome) and low grade inflammation. This test may help identify the extent of damage and act as a baseline to monitor the effectiveness of your treatment. All these tests may be oraganised during a consultation with Dr Serafin. (1) Probiotics – to help re-establish a healthy balance of appropriate gut flora. We routinely recommend ultra flora restore probiotics made by metagenics which contains a mixture of proven effective strains of bacteria at therapeutic doses which helps to colonise the small and large intestines which aids digestion and your immune system. (2) Digestive Enzymes – used to aid digestion if found to be diminished. We recommend using multigest enzymes made by Bioceuticals which is a balanced formula used for protein, fat and carbohydrate digestion. 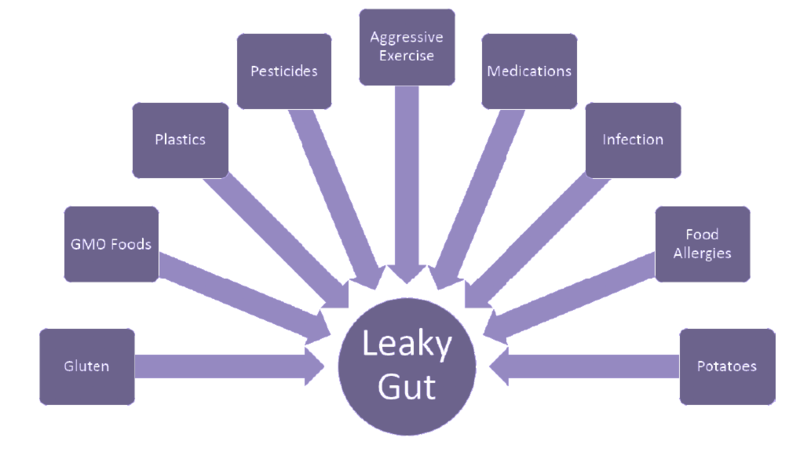 (3) Repair Leaky Gut – If leaky gut is suspected or diagnosed by a gut permeability test then we recommend using Intestamine made by Bioceuticals which contains high doses of glutamine, slippery elm, aloe vera and a host of other nutrients specifically formulated to treat leaky gut. (4) Eradicate any pathogen found – this step involves using the appropriate treatment to eradicate any candida, parasite or pathogenic bacteria found in your bowel. This step is essential for a complete recovery. For information on treating candida is here. Information on treating parasites and bacteria will be given during a consultation based on the results of sensitivity studies. (5) Diet – avoid any foods identified as being problematic by the food allergy blood test. Increase fibre in the diet. (6) Remove Heavy Metals – if found to be present you should act to remove any heavy metals by using either some form of chelation therapy such as DMSA or zeolites. More information on heavy metals is available here. (7) Esoteric Healing – energetically bowel problems are due to burying emotional issues and not dealing with them appropriately. Trying to manage the symptoms of this condition without dealing with these issues will only bury them deeper. We recommend esoteric healing to facilitate the process of letting them go and thus being healed. Click here for more information.